Why another book on Karl Marx? Publications in the last decade have included Karl Marx by Paul Thomas (Reaktion, 2012); Karl Marx: A Nineteenth Century Life by Jonathan Sperber (Liveright, 2013); Karl Marx: Greatness and Illusion by Gareth Stedman Jones (Harvard, 2016); and Marx’s Inferno: The Political Theory of Capital by William Clare Roberts (Princeton, 2017). Terrell Carver has reviewed several of these texts for the Marx & Philosophy Review of Books, and he is a formidable scholar of Marx and Engels, listing no less than 14 of his publications from 1983 to 2017 in the Bibliography of this new book. In particular, I was fascinated by publication in 2014 of his two volumes with Daniel Blank, A Political History of the Editions of Marx and Engels’s ‘German Ideology Manuscripts’, and Marx and Engels’s ‘German Ideology Manuscripts’: Presentation and Analysis of the ‘Feuerbach Chapter’ (Palgrave, 2014), reviewed on this site by Chris Arthur, where the reader can also find a critique by Meade McCloughan and responses and corrections from Carver. This was the “book” assembled as late as 1932 from manuscripts written by Marx and Engels but never published in their lifetimes, and published in English in 1970, edited by Chris Arthur, as “their major early philosophical work”. In his new book Carver repeats (24) that both the Economic and Philosophical Manuscripts of 1844 and The German Ideology which are “now not only canonical but generally top of the list of excerpted ‘must-reads’ for students” were both “artefacts of twentieth century editorial scissors-and -paste practices, coincidentally published ‘in full’ in separate volumes in 1932.” Indeed, Carver’s first chapter is entitled “Making Marx ‘Marx’”, a process which, he says, did not begin until 1872 with the republication in a ‘feature’ edition including a signed authorial preface, of the – by then – historical document (as Marx and Engels pointed out in their Forward) Manifesto of the Communist Party of 1848, as The Communist Manifesto. Carver points out that until that point Marx “was very little known, and then hardly favourably, outside the limited circles of German socialism”. Carver also reminds us that Marx published only one substantial book in his lifetime: Das Kapital. Kritik der politischen Ökonomie, published in German in 1867, with a French translation in 1872-5, a second German edition in 1872, and a third German edition including his substantial revisions in the French version, in 1883. The English translation, of the third German edition, was first published in 1887, only a few years before Marx’s death in 1883. A fourth German edition was prepared by Engels in 1890. Thus, Carver presents what he himself calls a “set of essays” on topics to think about when reading Marx. Carver organises the book in five thematic chapters, which highlight selected ideas in pairs, first in their present day context, then working back to Marx himself. In this spirit, Chapter 2 is entitled “Class Struggle and Class Compromise”; Chapter 3 “History and Progress”; Chapter 4 “Democracy and Communism/Socialism”; Chapter 5 “Capitalism and Revolution”; and Chapter 6 “Exploitation and Alienation”. I entirely support Carver’s desire to avoid “making a spurious claim that [Marx’s] ‘thought’ was a unity (or intended as such), that it culminated in tidy-minded ‘theories’ (or scientific or political ‘doctrines’) achieved largely through purely intellectual struggle, or that ‘it’ – the thought – was really Marx himself the political activist.” (10). I was curious therefore as to which aspect of the present day would command Carver’s attention. To my surprise this was the Occupy Wall Street protest movement that began on 17 September 2011, and lasted with diminishing effect until about 2013. Carver presents its main ideas and slogans on pages 35-6. Here he links Occupy to Marx’s early journalism in 1842-3 (pages 39, 41 and 42), notably “On the Theft of Wood”, in which, Carver says, Marx’s appeal was to “logic, fact and commonalities of moral experience – all without an ‘ism’” – adding that Occupy supporters fortunately for them, had the benefit of the US Bill of Rights, respected by the judiciary (this now sounds rather over-optimistic). Carver returns to Occupy to argue that there was “more compromise in Marx’s activities than he generally gets credit for” (56), though Marx and Engels, in their correspondence during the economic crisis of 1857-8, the first global ‘meltdown’, lacked, according to Carver, Occupy’s context of immediate popular activism. Carver returns to Occupy in his discussion, in Chapter 3, of Marx’s theory of history, or lack of it (61-3), commenting that the absence of history lectures at Occupy events and debates does not mean that participants “aren’t making assumptions and using presumptions that are about history. These presumptions are about what is and is not significant in human affairs and how new history-in-the making (i.e. a better future) will drive present struggles forward.” (63). Later, in Chapter 4, Carver discusses Marx’s “Towards a Critique of Hegel’s Philosophy of Right: Introduction”, published in February 1844, and credits Marx with developing a brief but explicit strategy for, and understanding of, political activism that anyone in Occupy could readily understand (98). In Chapter 5, Carver refers to Marx’s 1844 summary of Engels’s article “Outlines of a Critique of Political Economy” of the same year, which Marx found inspirational, and adds that “It would not be difficult to find similar sentiments at any Occupy or climate-change protest” (119). And in Chapter 6, “Exploitation and Alienation”, Carver notes that “Occupy was less concerned with such abstractions as alienation – much less human nature … and more with distribution of property and the capture of democratic institutions by corporate interests.” (165). In this regard it is odd, for me, that Carver seems to miss some important works which support his thesis. Marx was a passionate and merciless polemicist, in particular his unveiling at length of British collusion in the Russian menace in “The Story of the Life of Lord Palmerston” published in American and British journals in 1853-6, and “Revelations of the Diplomatic History of the 18th Century”, published in The Free Press in 1856-7. And in 1860 Marx took a whole year out from writing Capital to complete his Herr Vogt, answering at book length, published in German, the slanders against him, Engels and their supporters, by the revolutionary democrat (and Bonapartist agent) Karl Vogt in 1859, using forged police evidence produced against them in the 1852 at the time of the Cologne Communist Trial. Vogt alleged that they had engaged in secret and violent conspiracies and that Marx had acted as their dictator. The Prussian courts had denied Marx the right to sue Vogt, so Marx wrote his substantial book. An English translation was published in 1982. It is said that Engels considered Herr Vogt better than the “Eighteenth Brumaire”; Lassalle spoke of it as “a masterpiece in every respect”; Ryazanov thought that “in all literature there is no equal to this book”; Mehring wrote of its “being highly instructive even today” as to how to expose and deal with “a spy in the workers’ movement” – the subtitle of the English translation. However, my chief criticism of Carver’s approach is his apparent downplaying of Marx’s achievement, on which he spent so many years, in writing and re-writing Capital. Marx did not underestimate his own achievement. In a letter of 17 April 1867 Marx wrote to Johann Philip Becker that “ I left London by steamer last Wednesday and after a tempestuous crossing reached Hamburg on Friday afternoon to deliver the manuscript of the first volume to Mr Meissner there… It is without question the most terrible missile that has yet been hurled at the heads of the bourgeoisie (landowners included).” History has shown that Marx was on this point quite right. Marx’s analysis of capital’s insatiable drive for valorisation, and of the law of value from which not even the most rapacious capitalist can escape any more than she can escape the law of gravity, has lost none of its relevance. Carver seems not to have noticed some very serious recent work, notably (for me) Michael Heinrich’s An Introduction to the Three Volumes of Karl Marx’s Capital (2012) and Alex Callinicos’s Deciphering Capital (2014) to name but two, quite apart from Evald Ilyenkov’s classic The Dialectics of the Abstract and the Concrete in Marx’s Capital (1982). we find in Marx a whole series of attempts, discontinuations, shifts, new concepts and new beginnings” (a view he shares to some extent with Carver), Heinrich adds that “Marx did not expect people to take action against capitalism on moral grounds, but because of the fact that their immediate vital interests are constantly put into question. When people repeatedly resist those relationships, however, they will learn to fight, not only for an immediate improvement in their situation under capitalism, but also, from time to time, to challenge the very existence of capitalism as such. Marx’s Capital is quite helpful in those struggles. 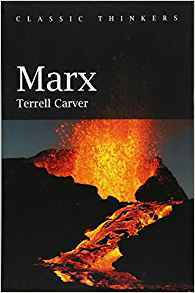 Despite my criticisms, I thoroughly enjoyed reading this new book by Terrell Carver, and recommend it for scholars of Marx, as well as for absolute beginners.